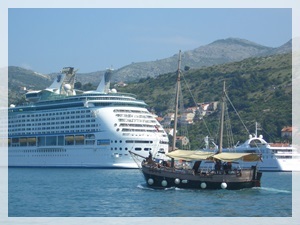 If you are catching a ferry or cruise ship from Dubrovnik and need to sleep over close to Gruz port you have a choice of numerous privatly run rooms and apartments as well as two hotels. 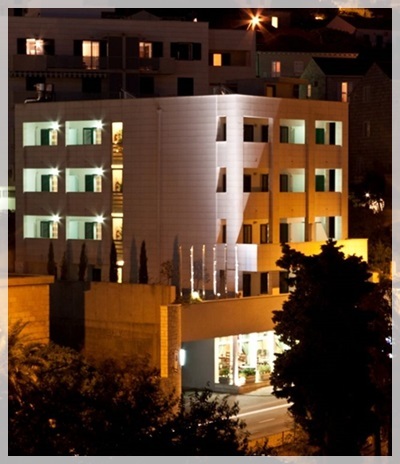 3-star Hotel Petka is located just across the ferry and cruise port. Only a few minutes walk from the ferry terminal there is a great family-owned Hotel Berkeley. In the near vicinity of the hotels you will find bus stop from where you can catch the buses to historic Old Town (buses No. 1A, No. 1B, No. 3) and beaches in Lapad area (bus No. 7). From the nearby pier you can take local ferries to the islands (Elaphiti, Mljet, Korcula). Many daily boat trips depart from there also. Hotel Petka which is located just opposite the ferry port offers accommodation in 104 guest rooms on four floors (96 double bedrooms and 8 single rooms). Rooms are basic but clean with free Wi-Fi connection and air-conditioning. Room located in the back of the hotel are smaller and without sea view. Room on the front all have balconies and views over Gruz harbour and Lapad. Guests of the hotel can enjoy at two restaurants: the main hotel restaurants and a la carte restaurant "Nostromo". Main restaurant serves breakfast with choice of cold and hot meals. Restaurant "Nostromo" offers an excellent choice of local Croatian food. Hotel's bar is located at the reception and has 60 sitting places inside and 100 sitting places on the terrace overlooking the Gruz harbour. Up the road from the hotel you will find several nice restaurants serving great food. Hotel has its own private parking area. Free wireless internet is available in all areas (free of charge). Only 5 minutes walk from the harbour 3-star Hotel Berkeley is located. This family-owned hotel is a great base for exploring Dubrovnik. Hotel has a great location close to the port and main bus station. Old Town and Cable car can be reached in only 10 minutes bus ride (bus No. 8). Hotel Berkeley has an excellent staff which will make your stay great. Hotel offers 24 rooms and apartments which are suitable for all types of travelers, from the single travelers to families and friends travelling together. Rooms and apartments are spacious and have comfortable beds and modern equipment. Each of them has either balcony or terrace. To enjoy views over Gruz harbour book rooms at the front of the hotel. Spacious apartments of 50m2 are ideal for families since it can accommodate up to 4 persons. Each apartment consists of bedroom, living room, bathroom and kithenette. Included in all room rates is a daily full breakfast which includes cold continental buffet, warm dishes made to order and freshly ground coffee. For other meals a short walk from the hotel several nice restaurants can be found. At the hotel they can arrange for you range of tours and excursions such as boat trips to the Elaphites, wine tasting to Konavle region or similar. Hotel Berkeley has an outdoor area (open from April to October) with heated pool and jacuzzi, sun deck with lounges and bar. Hotel Berkeley has its own underground parking which is free for the guests in the winter time while from 1st May until 30th of September it costs 35 HRK per day. Recently opened SPA at the Berkeley offers face and body treatments, massages as well as nail care. If you prefer private accommodation there is a great choice of rooms, guesthouses and apartments only short walk from Gruz port.